1000W Digital Ballast. High performance. Low Temperatures. Temperature Sensor. Compact/Durable Design. 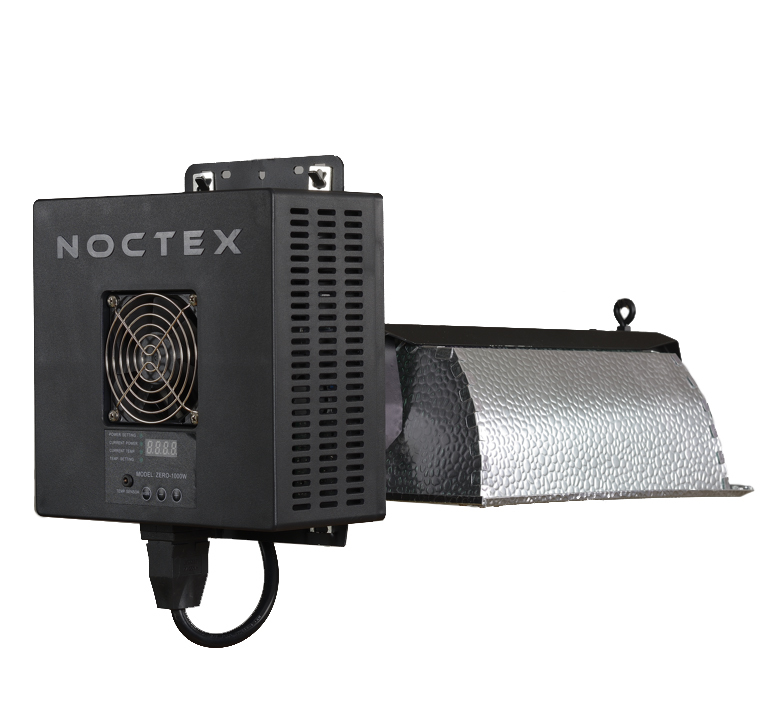 Featuring an intense cooling system, Noctex Zero 2 is one of the coolest running 1000w digital ballasts on the market today. Designed with every aspect of performance in mind, its unique, four fully vented sides along with the housing of a 41 CFM super fan, allow for unparalleled cooling that has never been acquired by any ballast of its class. Not only does it run 1/3 cooler than other digital ballasts, it also operates 15 – 20% brighter with full range dimming capabilities. With our temperature sensor cable, you are able to control your room's temperature by having the ballast adaptively dim to your set threshold. World’s top-performing electronic circuitry at affordability of the traditional type. Our industry leading ultra-compact design not only provides a smaller footprint during day-to-day operation, it also allows easy installation and maintenance which ultimately raises the bar above current standards. At just a hair over 6 lbs and the size of an average chocolate box, this is just another way we achieved the impossible. The circuit board is coated by a layer of anti-dust, anti-moisture material, protecting it from operational failure that may be caused by unwanted debris and moisture. As an exclusive feature only available in Noctex ballasts, this temperature control offers unsurpassed reliability and plant protection. With a 10 m sensor cable that is capable of detecting its surrounding temperature, this function allows users to set their preferred threshold, that of which when reached or exceeded, the ballast is automatically adaptively dimmed (to as much as 30% of its original output power) to lower the temperature. The cycle will repeat whenever it rises above the preset limit. Users can now have a peace of mind and do not have to concern about their plants getting dried up by excess or unwanted heating. At the core of the cooling system is a 41 CFM super fan with a rated speed of 3,000 RPM, this generates an unbelievable amount of airflow to keep the entire system running at maximum efficacy. The four-vented sides of the strong polymer housing also help to keep the ballast cool by allowing for great ventilation. The result of this innovation generates a ballast that is at least one-third cooler than the rest, and the quietest of its kind. After hundreds of iterations perfecting every aspect of the electromagnetic footprint, our engineering team was able to achieve the rare outcome of having almost zero interference. This is extremely important because you will no longer need to worry about causing any interference issues in the surrounding environment. The Zero 2 DE Fixture is one of the coolest running fixtures on the market today. Running on 120V, 240V as well as 277V and 347V (on special-ordered models), it drives high voltage horticultural double-ended lamps, which provides superior spectrum and PARs that leads to a much greater yield compared to regular single-ended systems. The kit adds a fixture and a bulb (400V DE EL Lamp) in addition to the Zero 2digital ballast.